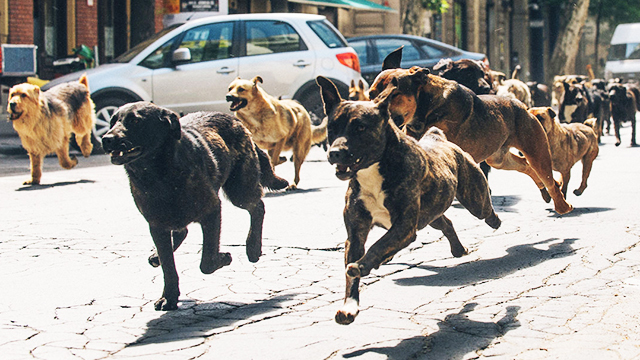 What should you do if you come across angry dogs while biking? Allow this man to show you how to stand up to them. Who didn't love biking around their neighborhood when they were younger? Biking with your pals was one of the funnest activities around before stuff like "adult responsibilities" came by. And one of the experiences tied with it is passing a street where a nasty canine barks at passers-by. Sometimes, that dog breaks free, and it's off to the races for us. It's a scary experience. It's not, however, as scary as this one biker riding along the Greece countryside. With footage from his on-helmet camera, we are given a first-person account of what it feels like to literally be hounded by an army of big, exciteable, and ready-to-bite furballs. The man, who later claims to be a policeman, is riding peacefully, perhaps enjoying the view, when suddenly a big platoon of dogs emerge from out of nowhere. Exhibiting pack behavior, the canines surround him, barking angrily. Some of them come so close that the man had to physically shoo them off. The man uses his bike as a shield, stays as calm as one could in such a situation, and screams at the dogs in an attempt to scare them off. The dogs pull back only after their owners come out and shoo them away. While the dogs never bit the man, who knows what could've happened if the man didn't fight for his survival like he did in the video? We're no experts in animal behavior but if he had try to run away, the dogs would have seen him as prey, and would've torn him down. A nightmare situation we wouldn't wish on anyone. Are You Part Of The 'Tularan Si Juan' Movement?